Porfirio is honored to be the director of this family-run program. He is well known not only as a master weaver and natural dyes advocate, but as a lecturer and presenter at institutions in the United States and Mexico, including the Oaxacan Textile Museum, the Smithsonian Museum of the American Indian, the Harvard University Art Museum, the Mingei Museum in San Diego, the DeYoung Museum in San Francisco and the Los Angeles County Museum of Art. He has been featured in numerous publications and has been included in the Santa Fe International Folk Art Market's Innovators pavilion for the past two years. When he isn't traveling for an exhibition, Porfirio returns to life in Teotitlán to curate travel experiences, create new designs and direct studio projects. Juana, Porfirio's sister, stands out in her community for being a master of natural dyes, native plants, and custom colorations. She possesses an incredible knowledge of techniques for creating vivid colors and subtle variations exclusively through natural materials. Juana teaches dye techniques to students interested in learning time-tested methods of working with indigo, cochineal, pericon, and other indigenous materials. Juana is a mother, grandmother, master instructor and oversees the studio guest rooms. Together with her husband, Antoño, she welcomes visitors into their home and quickly makes friends feel like part of their family. A lifelong weaver and dyer, Antoño teaches students from true beginners to more accomplished weavers. He loves seeing first-time weavers start out on a frame loom and create their first weaving. His expertise with every aspect of gathering plants, spinning, dyeing, and weaving with a variety of fibers from wool to ixtle makes him a true master of his craft. He is honored to lead students through traditional Zapotec tapestry lessons that he has learned from his ancestors. 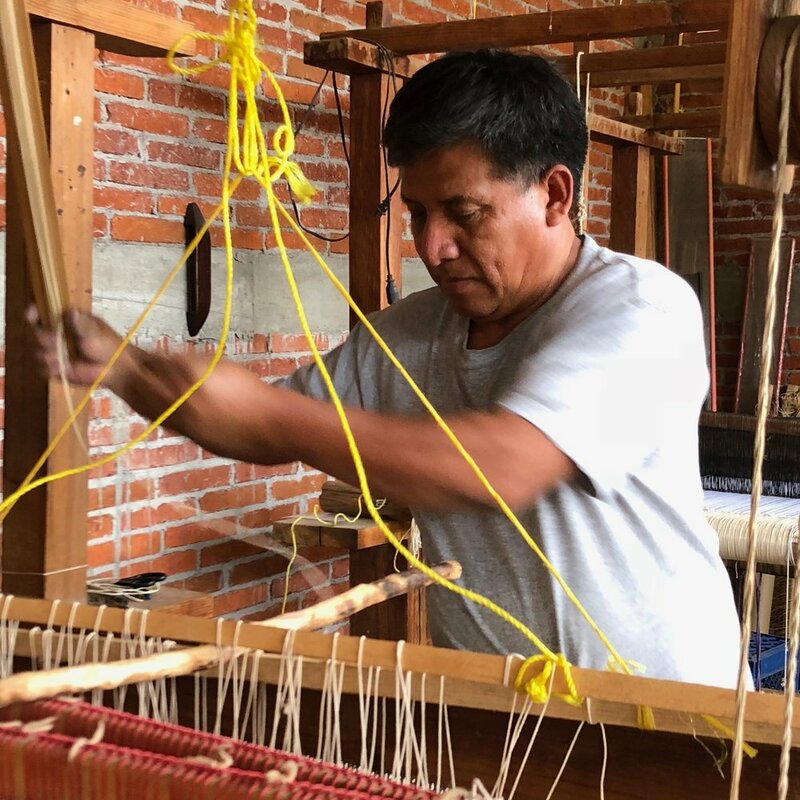 Nephew Claudio shares his life experiences as a weaver, furniture designer and member of Teotitlán's famous La Danza de la Pluma dance group with our guests. He is a favorite guide and interpreter, speaking Zapotec, Spanish and English. He accompanies our small group tours on daily excursions to cultural sites, the Sunday market in Tlacolula, and neighboring artisan studios. Claudio lived for several years in the United States and is very happy to be home again in Teotitlán with his family. Working with our clients from around the world, Leslie brings her many years of international arts experience to our team. She has worked for leading arts organizations and museums in the United States and lived in Mexico City. Leslie coordinates our group travel program and loves showing people the highlights of Oaxaca city. She speaks English, Spanish, a little Japanese and French, and is working on her Zapotec.